Would you like to measure highly viscous lubricant and oil samples at up to 80 °C? Anton Paar has the solution: Modulyzer for Petro! Density and the refractive index play a key role in the production of fuels, waxes, lubricants and similar materials. Many of these products are specified based on these two parameters in AS as well as other standards. Products in the petrochemical industry are often highly viscous and therefore not always easy to measure. To cope with these challenges, Anton Paar has developed Modulyzer for Petro. In its basic configuration, Modulyzer for Petro is a combination of a DMA 4100/4500 M density meter or a DMA 5000 M (the most accurate density meter in the world), an Abbemat-HP/WR refractometer and an Xsample Heated for the efficient, flexible and modular measurement of highly viscous petrochemical samples at temperatures of up to 80 °C. Measurements with Modulyzer are highly reproducible, precise and easy to perform. The magazine, the needle and all hoses are electrically preheated to a set temperature. As the viscosity of the samples drastically decreases when they are heated, the measuring cells of DMA M and Abbemat-HP/WR can be swiftly and effortlessly filled. After the measurement, Xsample Heated recovers the sample and automatically cleans the system. Sample handling is made easy and convenient for the user. The automatic filling warning generated by FillingCheck on the DMA Generation M density meters, the check of the filling procedure via U-View and the temperature management with ThermoBalance result in stable and reliable measuring results. LIMS connection is also possible, turning Modulyzer for Petro into a versatile partner in the laboratory. With a wide range of functionalities, such as API compensation for density to 20 °C, a lot of time and costs can be saved, especially for process samples, for which accurate results are needed immediately for taking correct further action whenever necessary. 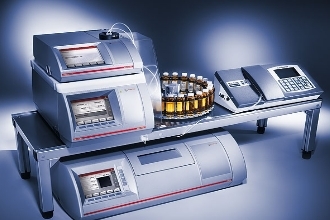 In addition to its modular concept, Anton Paar’s Modulyzer for Petro offers numerous advantages such as simultaneous measurement of density and the refractive index, unsurpassed accuracy and reliability and automated filling by Xsample Heated. Modulyzer for Petro is designed for space-saving Plug & Play installation, requires small sample volumes only and protects operators from exposure to putrid or hazardous solvents. Anton Paar GmbH was established in 1922 as a one-man locksmith’s workshop. Today, over 1,700 employees worldwide develop, produce and distribute high-quality measuring instruments for the determination of properties such as density, temperature and viscosity as well as high-precision mechanical parts and assemblies. Anton Paar has strong links with universities and research laboratories worldwide. The company is owned by the Santner Foundation, which invests in research in the field of science and technology as well as in the rehabilitation of drug addicts. For more information, visit www.anton-paar.com.